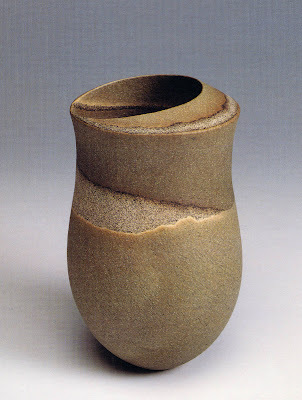 The great potter, Hamada Shoji, when asked how to identify a good pot, said "The good pots are the ones I like... for me." 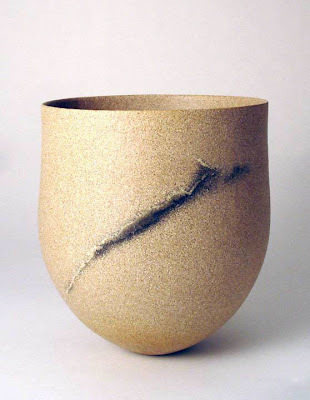 Jennifer Lee makes these wonderfully quiet but strong hand-built vessels. 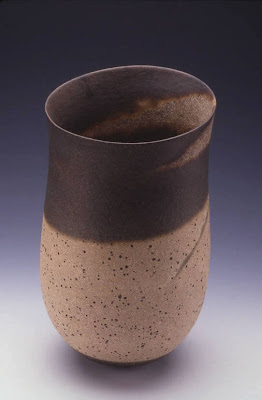 She incorporates oxides and sands into the body to give the colors and textures. The oxides, which she gets from all over the world can be coarse or fi ne, each giving it's own texture and feel. Occasionally the interaction of two ajoining oxides will create a halo effect. The base is pinched to about 1/3 of the height and the rest is built up in tall bands. 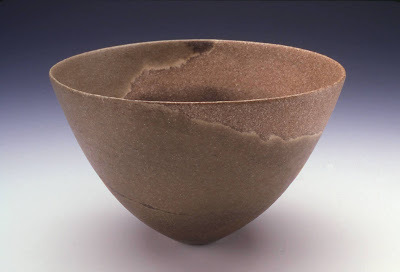 Some of her signatures are the asymetrical 'ledge' like rim on the top pot and, lately, a diagonal band of inlayed colored clay. You can find images of her work on-line, she's represented by the Galerie Besson http://www.galeriebesson.co.uk/ in London and the Frank Lloyd Gallery http://www.franklloyd.com/ in the US. I would love to have one of her pots but, starting at $3000 they're way out of my price range. She says she only makes about 18 pots a year which I suppose helps keep the value up. Hello Russell: Thank you for the great blog entry on Jennifer Lee. I had never heard of her before. That's one of the reasons I thought I would do the blog. Russell, thank you for posting about Jennifer Lee. I first discovered her two years ago when I purchased Jane Perryman's book "Naked Clay'" which is loaded with great work. Do you know where I can find more information about her prices and buying her work? The galleries don't seem to list such info. Hi, my name is Russel and I'm a Pot Fondler. There I said it and already I feel better about it. I'm the guy you've seen skulking behind the potted ferns in galleries and fairs just waiting for you to turn your back so I can get at your pots. I can't control it! In the presence of good pots something just comes over me! I've got to feel the balance of their weight, pet their bottoms, stroke their sensuous curves, nuzzle their graceful necks, their luscious lips!!!! Sorry, I'm getting carried a way just talking about it! As if that weren't enough! I even MAKE POTS for OTHER PEOPLE TO FONDLE!! I build simple friendly forms, by hand with warm subtle hues of smoke firing, a combination just waiting to trap the latent pot fondler. And I know you're out there! I've seen you stealing glances at other potter's handles, seeming to "accidentally" brush against the curving hip of a large urn, casually upsetting a pot to get a better look at the foot ring (foot ring fetishists!). But you needn't feel ashamed, it's natural, and you're not alone. Give in to your desire, you have nothing to lose but your pocket change!